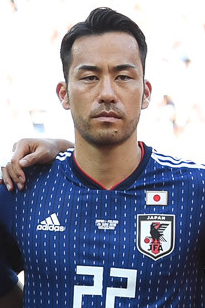 ↑ "Maya Yoshida". fifa.com. FIFA. สืบค้นเมื่อ 15 January 2014. ↑ "Maya Yoshida profile". Southampton FC. สืบค้นเมื่อ 2 March 2015. ↑ "Japan's Yoshida Set For Saints". Southampton FC. 30 August 2012. สืบค้นเมื่อ 30 August 2012. ↑ "Southampton sign Maya Yoshida, Japan's Olympic captain". BBC Sport. 30 August 2012. สืบค้นเมื่อ 1 September 2012. ↑ "Saints agree partnership with EA SPORTS". Southampton FC. สืบค้นเมื่อ 9 August 2013. ↑ "Sunderland 2 – 1 Southampton". BBC Sport. 6 November 2013. สืบค้นเมื่อ 6 November 2013. ↑ Hassan, Nabil (22 February 2014). "West Ham 3 – 1 Southampton". BBC Sport. สืบค้นเมื่อ 21 March 2014. ↑ Cryer, Andy (20 December 2014). "Southampton 3 – 0 Everton". BBC Sport. สืบค้นเมื่อ 31 December 2014. ↑ Lucas, Jim. "Yoshida extends Saints deal until 2018". Southampton FC. สืบค้นเมื่อ 8 January 2015. ↑ Wilson, Jeremy (28 October 2015). "Southampton 2 Aston Villa 1, match report: Maya Yoshida and Graziano Pelle goals end Villa's cup hopes". Daily Telegraph. สืบค้นเมื่อ 29 October 2015. ↑ Prentki, Tom (28 October 2015). "Southampton 2 - Aston Villa 1: Yoshida and Pelle goals sink managerless Villains". Daily Express. สืบค้นเมื่อ 29 October 2015. หน้านี้แก้ไขล่าสุดเมื่อวันที่ 31 มกราคม 2562 เวลา 00:56 น.